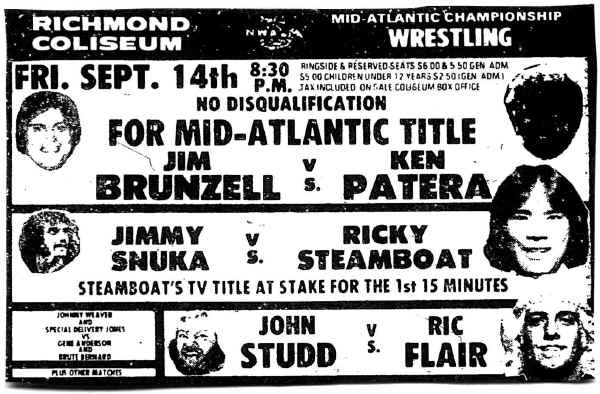 Jim Crockett Promotions put on a memorable card of Mid-Atlantic Championship Wrestling on the evening of September 14, 1979. The card included a major title change in the Main Event, plus a couple of other outstanding and intriguing bouts near the top of the card. Even the mid-card and preliminary matches on this night had a lot to offer. It was quite a night at the Richmond Coliseum! 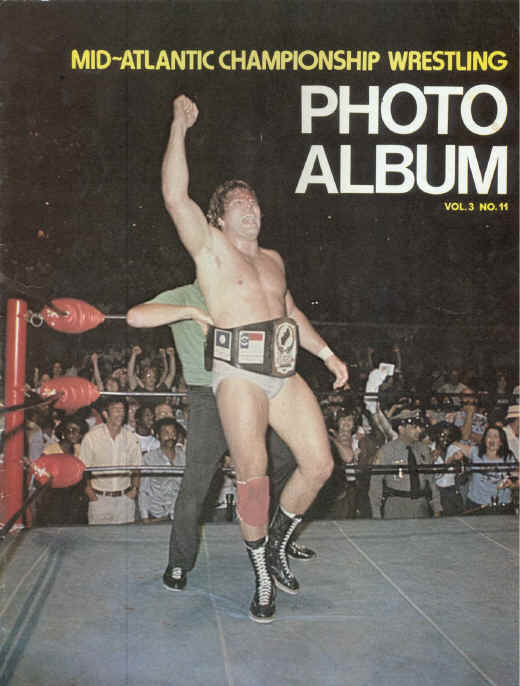 Ken Patera entered the Richmond Coliseum this night as perhaps the most dominant Mid-Atlantic Heavyweight Champion ever. Patera defeated the legendary "Chief" Wahoo McDaniel for the Mid-Atlantic Title in April of 1978. Except for losing the title to strongman Tony Atlas for a very brief time in mid-1978, Patera had essentially held the title for a year and a half when he faced the challenge of "Jumpin’ Jim Brunzell" this night in Richmond. Brunzell had come to the Mid-Atlantic area earlier in 1979 from the AWA, where he had primarily been known as a tag team wrestler. There was a good buildup between Patera and Brunzell leading to their climactic bout in Richmond. The title switch was set up a couple of weeks earlier on the Mid-Atlantic Championship Wrestling television program, where Brunzell pinned Patera twice on the same TV show. This scenario was similar to an effective angle done two years earlier between Blackjack Mulligan and Dino Bravo, where Bravo was set up in the same fashion as a legitimate contender to Mulligan’s U.S. Title. 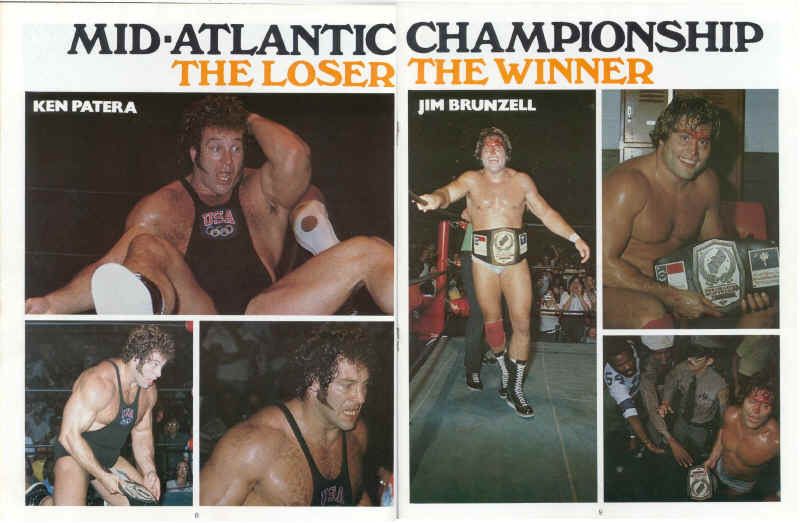 While there was a tremendous size and strength difference between Patera and Brunzell, Jim was able to utilize his speed and quickness to upend Patera and win the Mid-Atlantic Title this night. Patera dominated most of the match and bloodied Brunzell, but Brunzell captured a quick pinfall that ended Ken Patera’s impressive reign as the Mid-Atlantic Heavyweight Champion. Brunzell would have a decent reign as the Mid-Atlantic Champion, trading the title with Ray Stevens later in 1979 and finally losing the belt for good to the Iron Sheik in the spring of 1980. This was a "Champion vs. Champion" match. Jimmy Snuka had won the United States Heavyweight Championship two weeks earlier in a tournament. Ironically, Snuka defeated Ricky Steamboat in the finals of that tournament. At this time, Steamboat was the NWA Television Champion. In this match, only Steamboat’s title was at stake as the TV title was always at stake for the first 15 minutes of any match that the champion wrestled. These two put on a spectacular high-flying display that was a sight to behold. This match was non-stop action from the two former friends, who had called themselves the SPC (South Pacific Connection) only months before prior to Snuka turning heel. The match ended on a disqualification from Snuka, but only after the two had thoroughly dazzled everyone in attendance. This was an intriguing match for a number of reasons. 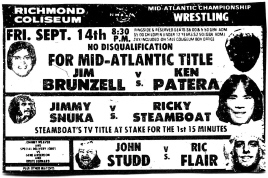 By 1979, it was rare indeed to see any Mid-Atlantic card with Ric Flair involved in the third match from the top. It goes to show the strength of this particular card. Flair was about three months into his first Mid-Atlantic run as a "good guy." Ric had brought Studd into the area in late 1978 to collect a bounty that Flair had put on the head of Blackjack Mulligan. The storyline was that Ric was in Hawaii and "discovered" Studd on that trip and brought him back to the Carolinas. 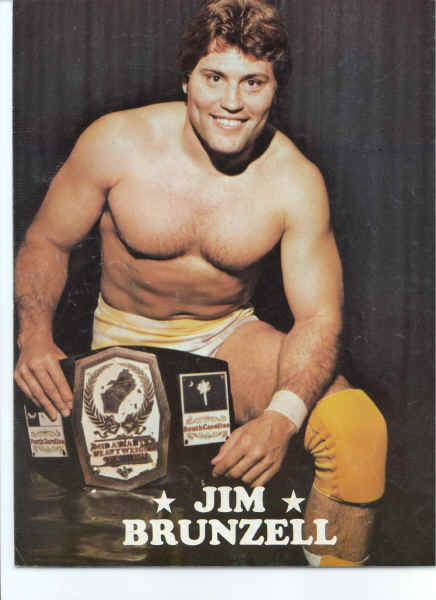 Veteran Mid-Atlantic fans would have recalled that Studd was actually the same person as Chuck O’Connor, who had wrestled for Jim Crockett Promotions in 1974. This match was an extremely rare singles confrontation between Flair and Studd, as the two never worked a real program together. The difference in size between these two was staggering, and much like the Brunzell-Patera match, the bigger Studd dominated his smaller foe during much of the match. But by the end of the bout, the quicker Flair began running circles around his bigger opponent and ultimately snared a quick pinfall on the giant Studd. This was a fascinating bout to me, because if you took S.D. Jones out of the equation, you would have had a Jim Crockett Promotions Main Event from the 1960’s! Weaver, Bernard and Anderson were all on the downhill sides of their respective careers at this point in time, but they turned back the clock and put on a good and entertaining show on this evening. Weaver and Jones won the match, but that was secondary in my mind. I recall watching and wondering how many more times would I see these great aging stars wrestle against each other. It was interesting that a couple of former WWWF World Champions wrestled preliminary matches on this Richmond card. Former WWWF World Champion Pedro Morales teamed with Bob Marcus to defeat Charlie Fulton and David Patterson. Former WWWF Tag Team Champion Tony Garea beat veteran Swede Hanson. I wish that somehow Hanson had been part of the later tag match involving Weaver, Bernard and Anderson! That match would then have truly been a trip down Jim Crockett Promotions "memory lane!" The opening bout saw a rare battle of "good guys" as another old-timer, Abe Jacobs, wrestled to a draw against Coco Samoa. This event had all the ingredients to place it among the best ever Mid-Atlantic Wrestling cards in Richmond. September 14, 1979 has thus been given the distinction of being placed at number 13 on my all-time list. An unlucky number, but for those who witnessed this card, they count themselves as very lucky! of this newspaper promo ad.